Andalucia is a top destination for walking, we head out of the door and in any direction. There are few obstacles except natural ones, we´ve had to backtrack because of not being able to cross streams. Here is a route we´ve been checking out and hope to walk in stages as well as our more local Camino Mozarabe we want to do. So little time! 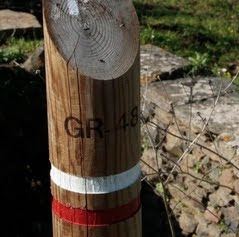 So if you fancy a change from the commercialised GR -65 Santiago de Compostela walking route try this newly restored and signed route from Portugal to Jaén in northern Andalucia. New signposts and markers have been added all along the route, just look out for the red and white signs. 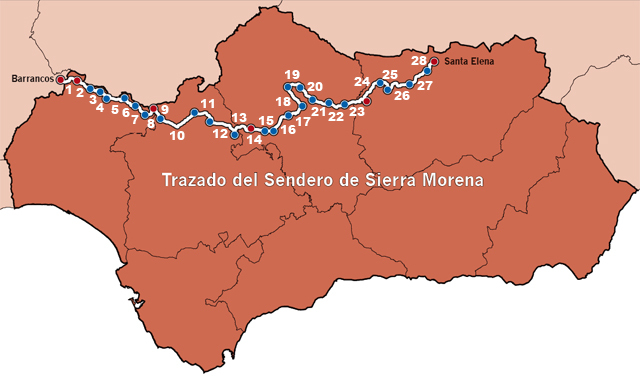 Stages of the GR 48 Sierra Morena walking route. The photo and map are from the Spanish GR -48 walking site. There is a guide available in English drop me an email and I´ll translate how to get one - rachel dot martos at gmail dot com. 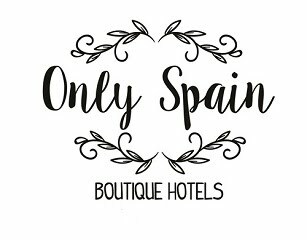 There is a lovely rural hotel right on the GR48 route at Montoro - Hotel Rural Molino La Nava.